Belly fat promotes insulin storage, which increases hunger and cravings for sugar and carbohydrates, further boosts fat storage around the belly area. The fatter a person gets, the more insulin-resistant they become, which creates a vicious cycle of craving carbs and sugar, unwanted weight gain, yo-yo dieting, becoming hungry and gaining more weight again and again. 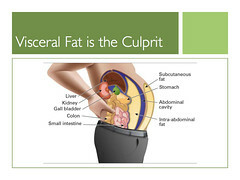 Visceral Fat – Not visible, but hides out deep in the abs and wraps itself around vital organs. While subcutaneous fat can make you look and feel unattractively fat, it is the invisible visceral fat that is the real problem. Visceral fat functions like an endocrine system because it is metabolically active itself. It releases enzymes and hormones into the bloodstream that raise blood pressure, increase bad cholesterol (LDL) and lower good (HDL) cholesterol. Visceral fat also interferes with the body’s ability to use insulin and increases estrogen levels. Too much visceral fat can increase the risk of cardiovascular disease, breast cancer, type 2 diabetes and other unhealthy conditions. It is important to immediately reduce sugars, simple carbohydrates, processed foods and any products made with high fructose corn syrup. It absorbs quickly, boosts inflammation, blood glucose and insulin levels. Artificial sweeteners such as aspartame increase inflammation and insulin resistance, ultimately triggering increased storage of belly fat. Traditionally, the Mediterranean dietincludes high consumption of olive oil, legumes, beans, nuts,unrefined cereals, fruits, vegetables, fish, moderate servings of dairy, red wine, and keeping the consumption of red meat low. It’s deliciously satisfying, simple and proven to be healthy… People following the Mediterranean diet lose more weight, maintain key improvements in cholesterol and reduced blood pressure. 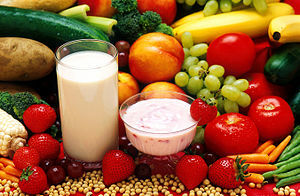 Subsequently, their risk of heart disease is lower more than people on a low-fat diet. Omega-3 Fatty Acids from fish oil also help reduce damaging inflammation which promotes unhealthy insulin resistance and subsequent accumulation of belly fat. Green Tea contains catechins,the powerful antioxidants that have been proven in several studies to release fat cells and allow more efficient weight reduction. 5. Fresh Fruits and Vegetables Are Nutrient Rich and They’re Full of Water and Fiber.. Fruits and veggies have the unique ability to expand in your stomach and fill you up with fewer calories and nearly no fat! Eating a diet high in whole grains and low in refined carbohydrates makes it easier to minimize storage of fat throughout the body. Nutrition specialists and food scientists believe the dietary fiber and magnesium in whole grains may help maintain insulin sensitivity. One of the most important areas currently being studied is the crucial role of whole grains on measures of insulin sensitivity. Never underestimate the importance of exercising for at least 30 minutes a day, at least five days a week. A good combination of cardio, resistance (strength) training and interval training is best, depending on your age and general physical condition. People who don’t exercise are more likely to regain weight than those who combined a healthy Mediterranean style diet with regular aerobic exercise five days a week. People who exercise regularly also improve their cholesterol levels, aerobic capacity, blood pressure and blood glucose levels. Interval training means alternating periods of intense exercise with low-intensity exercise or rest, and can be used successfully with any type of aerobic sport, such as walking, biking or jogging. Alternate slow and fast cycling or fast walking and running, recommends the Mayo Clinic. For example… A 20-minute cycling regimen that includes sprinting on a stationary bike for 8 -10 seconds followed by 12 seconds of light cycling. A person can lose more belly fat than those doing only cardio, even though the cardio workouts are almost twice as long! It’s also important to note that proper interval training suppresses the appetite hormone known as Ghrelin. Thus, a person naturally want to eat less. endurance by doing repetitive exercises with weights or weight machines. Building lean muscle speeds up metabolism and fat burning efficiency. Start to reap the rewards of resistance training with least 30 minutes two or three times a week.People can lift weights and do circuit-training at the gym, and do resistance crunches and push-ups at home or office. Experts recommend performing the resistance training workout before your aerobic workout to get best overall results and to burn maximum fat. When a person successfully decreases their belly fat, they will firm muscles in their central core: abs, back and chest, so they look fitter and slimmer. With stress, the body increases its production of Cortisol, a dangerous hormone that increases the appetite and makes people crave high-fat, high-sugar comfort foods such as cookies, cake and ice cream which all pack on unwanted, unhealthy pounds. Research at Georgetown University Medical Center demonstrated that chronic long-term stress resulted in metabolic syndrome, a series of unhealthy symptoms including inflammation, weight gain, insulin resistance and increased belly fat. To effectively reduce stress, try gentle stretching, deep breathing, yoga or meditation, or take a long nature walk. Studies show that inadequate sleep affects levels of two key appetite hormones, Leptin (which decreases hunger) and Ghrelin (which increases hunger). Several studies have proven that people who sleep only 5 hours compared to those who sleep at least 8 hours experience a dramatic decrease in Leptin and increase in Ghrelin, resulting in additional weight gain. The increase in appetite and craving of high-carb foods like cookies, candy and cakes, rise significantly when a person skimps on sleep!. Be sure to get at least 7 – 8 hours of quality, restful sleep each night.